Maid of the Mist VII engine room showing silencer and exhaust line fitted with Shannon reusable insulation. 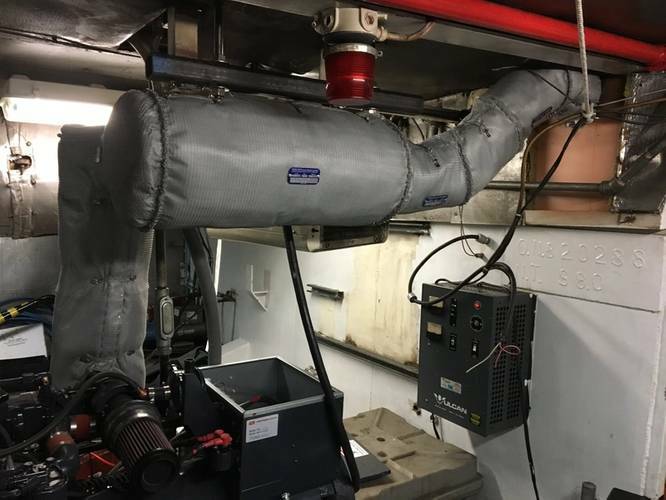 As part of a modernization program for the boats' lighting and climate controls, Maid of the Mist's engineering team installed a new generation set - including two, 38 kW Northern Lights marine generators - for both vessels. 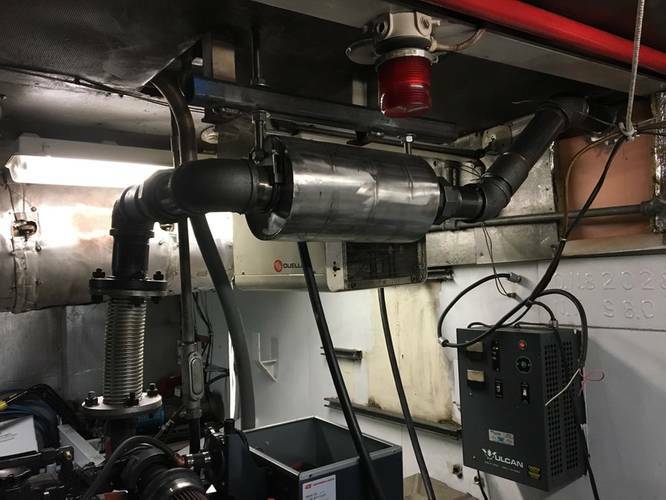 The tour boat company also replaced the rigidized pipe used for its vessels' exhaust lines with flexible pipe and increased the diameter of the generators' exhaust lines to 3 inches. For high-temperature applications such as engine manifolds, mufflers and exhaust piping, Shannon manufactures a custom fit reusable high-temperature thermal blanket following the company's HT1100MSGM design specification, which, among other things, resists chemicals and weather and retains radiant heat up to 1,100 F (593 C). Shannon designed and manufactured approximately 15 reusable blankets for each boat, including acoustic blankets that have reduced sound within six feet of the generators by 4 dBA. Each Shannon thermal blanket also meets testing standard ASTM C335, and the acoustic blankets passed test standards ASTM-E1222 and ISO-15665. "We were in a time crunch to get these new generation systems insulated," said Corey Parish, chief marine engineer for Maid of the Mist. "Shannon's standards and specifications assured us that a quality insulation system and better engine efficiency would be what we got for our money." "The concept of reusable insulation began in the marine industry, before World War II, to help mechanics access components as part of routine maintenance and emergency repairs on ship systems," said Frank Kovacs, president of Shannon Enterprises. "All insulation is removable. "But designing reusable insulation requires adhering to standards and making a ruggedized product that's easy for mechanics, machinists and other machine operators to remove and replace in a few seconds or at most minutes," added Kovacs. Maid of the Mist first launched in 1846, making it one of North America's longest running tourist attractions. Maid of the Mist boats have been continuously operating tours to the base of Niagara Falls for 133 consecutive years, providing guests from around the world with an iconic experience, traveling to the base of Niagara Falls. James V. Glynn joined Maid of the Mist in 1950 as a ticket seller and purchased the company in 1971. Under his leadership and that of current president Christopher M. Glynn, Maid of the Mist has expanded operations, now attracting more than 1.6 million guests each season.